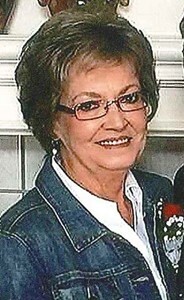 Mary "Darlene" Hartwick, 70, of Olathe, passed away on January 27, 2016 at Olathe Medical Center. She was born on May 7, 1945 to William "Tom" and Frances Laurene Lawrence. Darlene was most recently employed with First Student. She is survived by her loving husband, Thomas, her children, Kelly McGinnis, Darren (Jess) McGinnis , David McGinnis, step-daughter Tammy Lindeman, sister Judy Jacobs, grandchildren Audrey McGinnis, Tylor (Katie) Hermson, John, Deborah, Mathew, Megan, Dierra, Delaney, Tasha, Breck and Taylor Lindeman and great grandchildren Forest, Mali, Jase, Stryker, Evelyn. She was preceded in death by her husband Frank Meis, and her sister Rosy. Add your memories to the guest book of Mary Hartwick. This loss is huge. We relied on the fact that you would always be there. Rest in peace Darlene, your memory is embedded in our thoughts, worn in our smiles and will last all of our days. Darlene was my very dear sister in law and we were rocks for each other. I loved her very dearly. We had a lot of laughs together, we also laughed a lot on the phone. I will miss her tremendously . My prayers and love are with the rest of the family. I've known Darlene since the day I was born. For many years, she was like a mom to me. My heart breaks for her family. Much love to all. R.I.P. Darlene, you had a tough life, it's time for your soul to feel blessed. Darlene my friend and confidant, boy did we have some great times together! You are so fun and exciting, I will bet you will keep those angels on their toes! I know that you were very happy and lived as positively as possible. Stay sweet my Darling Darlene. You will be missed. Tom, I never got to meet you, however if Darlene loved you then so would I. My heart is heavy for you. Bless you dear one.